Certain films are able to transport you to specific places despite your viewing locale. No one did this better or more regularly then the late, legendary Robert Altman. And though one may be quick to herald his frontier town of Presbyterian Church in "McCabe & Mrs. Miller" as the most vivid world Altman ever presented the place I hold closest to my heart is the Holly Springs, Mississippi (its greatest claim to fame being the place where General Grant's advance was halted in 1862) of Altman's "Cookie's Fortune". Maybe I say that simply because Presbyterian Church was a dreary, foreboding place where the cold and emptiness could seep into your skin even while watching it enveloped in a warm blanket on the comfort of your couch. Holly Springs, on the other hand, maintains a sunny, warm disposition even in the face of the hamlet's most beloved member being accused of a murder he didn't commit. But I'll get to all that in due time. 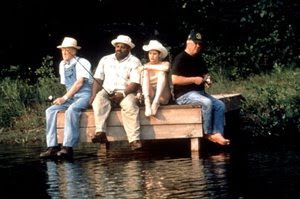 The film maintains the feel of its main character Willis's (Charles Dutton) leisurely gait around town. It is in no hurry. Altman lets his camera roam into the nooks and crannies, not just of Holly Springs but of the characters themselves. The Cookie of the title (Patricia Neal) is a widow still deeply in love with her husband Buck and climbing in age. As we see her tucked inside her home we realize it is not simply the art department creating a southern gothic look but a place where a person has resided for a long time and hoarded away many possessions which have special meaning. Dutton's Willis is her caretaker and he turns up in the middle of the night, as promised, to clean her gun collection. Trouble is the next morning as Willis goes out to take care of a few errands Cookie grabs hold of a freshly scrubbed gun and takes her life. The way Altman lets this scene play out is wonderful in that it does not aim for drama of any kind. We clearly see what Cookie is up to and by the time the scene concludes we understand why she has done what she has and even feel a little happy for her. Shortly after this Cookie's nieces tightly-wound Camille (Glenn Close) and the not-quite-all-there Cora (Julianne Moore) show up to acquire a borrowed bowl for their Easter dinner. Upon seeing what Cookie has done Camille flies off the handle, unwilling to allow such a "disgrace" to bring harm on the family name. The word theatrical is often used in association with movie villains but in this case such a word is less a fanciful description than a literal one. Camille is currently directing the Holly Springs Easter Play (Oscar Wilde's "Salome", which she has, of course, taken the liberty of re-writing). No one can block a scene like Camille and so she immediately scoops up Cookie's gun and sets about re-staging everything to give it the appearance of a murder. She then makes Cora swear not to tell a soul and Cora will keep that vow come hell or high water. All this ends with Willis being the prime suspect considering his fingerprints are all over the gun and so he is carted off to jail. No one in Holly Springs, however, believes Willis did it. The sheriff (Ned Beatty) is his fishing buddy and lets himself into Willis's cell to play scrabble. The cell door itself is left wide open but the young deputy (Chris O'Donnell, in the best performance he's ever given and probably ever will give) is less concerned with Willis fleeing than with taking Cora's daughter Emma (Liv Tyler), who has just turned up back in town, behind the jail's Coke machine for a little, shall we say, carnal knowledge. Emma, after all, considers Willis family and pledges to remain in the cell with him until his innocence is proven. You may think I'm bringing up characters without truly introducing them but this is the way of an Altman film. It has been said this is because his characters are already there and have been so for a long time. The residents of Holly Springs have been there and have been so for a long time. And that's something with which they are okay. No one rushes in Holly Springs, time almost seems to stand still. This is why the out-of-town detective (Courtney B. Vance) sent to investigate the "murder" is confused by how so many people can claim to have seen Willis in so many different places at the same time. Dutton's marvelous performance stands at the center of the film. An affable fellow, he's a symbol of the whole town without ever ceasing to be a real person. He pilfers a bottle of Wild Turkey from the local bar but makes sure to replace it. He's not defensive around the out-of-town detective and instead introduces himself politely as "your suspect." And take special note of the scene where Willis returns home to find Cookie dead and he finally pulls the grocery bag he has been carrying away from his chest to reveal a shirt stained from what has leaked through the paper. It is as heartbreaking as it is gentle. The film could be considered a comedic mystery, I suppose, but by allowing the audience to witness all events pertaining to Cookie's death and the aftermath it becomes less about the investigation and more about the characters' behavior in relation to the events. The biggest mystery revealed has nothing to do with the "murder" at all. In a way it is one of the most illustrious illustrations of the most ancient, the most tried, and the most true of all themes: good triumphing over evil. But it never specifically says this nor does it choose to press this matter. Janet Maslin of the esteemed New York Times noted in her original review that the film "unfolds with a simple decency". The residents of Holly Springs never seem to doubt things will properly run their course and thus they just sit back and let them. The Unforced Smile is is one of the most beautiful and cherishable phenomenas of movie-going. You slowly come to realize the movie before you is so wonderful you're smiling, though you do not recall when or where the smile popped up. The Unforced Smile can last for one scene, two, three, and sometimes, on the rarest of occassions, for the duration of a whole film. I smiled my way through the entire running time of "Cookie's Fortune" but I'm not sure I knew it until the last scene.